With a legendary history that includes five Super Bowl Champion teams and Hall of Fame players including Joe Montana, Jerry Rice and Steve Young; Candlestick Park was the home to some of the greatest teams in NFL history. Originally built for the San Francisco Giants (MLB), Candlestick Park was the home of the 49ers for over four decades. Talk of building a stadium in the San Francisco area began in 1954, when mayor George Christopher promised to build a stadium if a major league team would move to the area. Later in the year, a $5 million bond was issued to build a new stadium. Along with the Brooklyn Dodgers (MLB), the New York Giants (MLB) decided to move to the west coast after the 1957 season. The Giants moved to San Francisco, while the Dodgers moved to Los Angeles. Two locations for a new stadium in San Francisco were discussed. One in downtown, and one at Candlestick Point. The site at Candlestick Point, located near the San Francisco Bay, was chosen because of its lower price and affordability. Construction of the stadium began in August 1958. However, immediately after construction began, several problems arose. Neighbors complained about numerous things, grand juries investigated irregular funding in the stadium, seat installation was delayed because of a teamster strike, and the stadium was called a “fire trap.” Nevertheless, the stadium was completed. The stadium was named Candlestick Park, after its location. The Giants played the first game ever at Candlestick Park on April 20, 1961. In September 2004, Candlestick Park was renamed Monster Park, after Monster Cable Products Inc. purchased the naming rights for four years. The stadium’s named reverted back to Candlestick Park in March 2008 after the stadium naming rights deal with Monster Cable Products expired. A city ballot measure restricted the team from pursuing the highest bidder for the right to name the stadium. 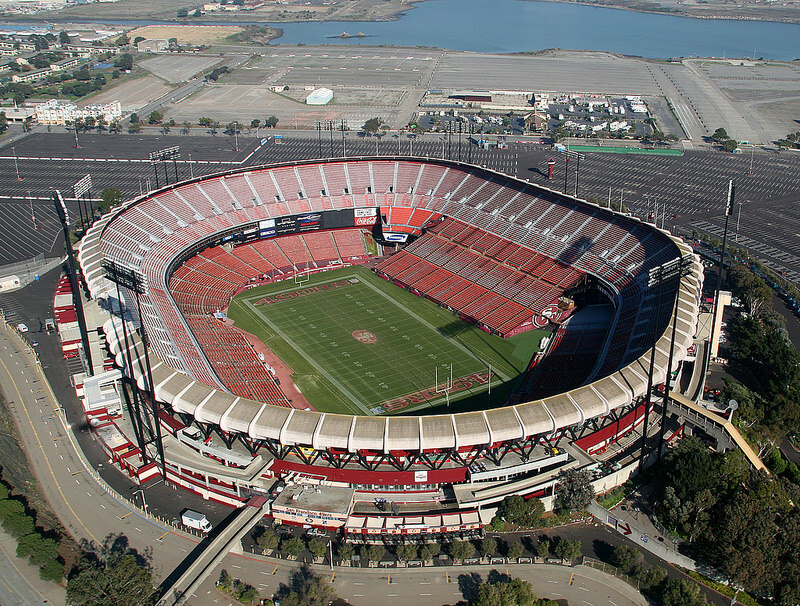 When it first opened, Candlestick Park had around 45,000 seats. While the Giants were playing at Candlestick Park, the 49ers were playing at Kezar Stadium. The 49ers had played at Kezar Stadium since 1946. After only several years of existence, Candlestick Park began to deteriorate. At one point, the mayor of San Francisco proposed that a new $50 million stadium be built in the downtown area, but his idea was dropped. After the city decided to spend $16.1 million in 1971 towards improving and making the stadium more multipurpose, the San Francisco 49ers (NFL) decided to move there. Candlestick Park was enclosed, increasing the seating capacity to 61,000. Retractable seats were added in right field to allow the conversion to a football field, and the grass field was replaced by Astroturf. The 49ers played their first game at Candlestick Park on October 10, 1971. Very few changes have taken place since 1971 at Candlestick Park. In 1979, the Astroturf was replaced by grass. In 1995, Candlestick Park was renamed 3 Com Park after 3 Com Corp. bought the naming rights. After the 1999 MLB season, the San Francisco Giants moved into AT&T Park, leaving the 49ers as Candlestick Park’s primary tenant. The 2013 season marked the 49ers last year at Candlestick Park before they moved into their new stadium, Levi’s Stadium, in Santa Clara in 2014. 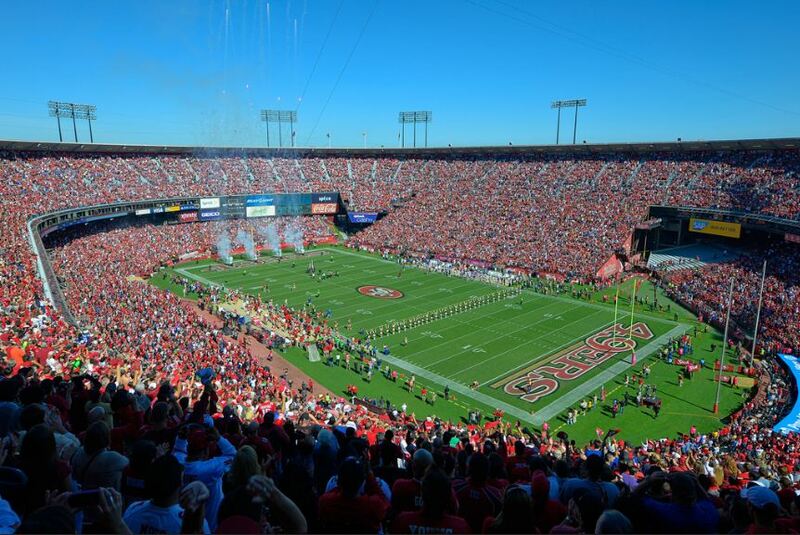 The 49ers played their last game at Candlestick Park on December 23, 2013 against the Atlanta Falcons. The stadium was demolished in Winter 2015 and the site will be used for a mall and residential/office complex.